Habit: Perennial herb; hairs spreading, +- coarse; caudex +- woody; red root dye 0. Stem: 1--several, 1.5--4 dm, clustered, +- branched. Leaf: +- few, scattered; blade 2.5--5 cm, oblong to lance-ovate. Inflorescence: open panicles +- few, or flowers 1 in upper leaf axils; pedicels 4--7 mm, recurved in fruit. Flower: corolla 12--18 mm, 1.5--2 × calyx, 7--9 mm diam, salverform to funnel-shaped, golden yellow, lobes entire, appendages 0. Fruit: nutlet 3.5--5 mm, wide-ovoid, abruptly short-tipped, smooth, shiny, white. Chromosomes: 2n=28. Ecology: Open, dry slopes, yellow-pine forest, pine/oak woodland, chaparral; Elevation: 250--1900 m. Bioregional Distribution: KR, NCoRH, NCoRI, CaR, n SNH; Distribution Outside California: southwestern Oregon. Flowering Time: Apr--Jun Note: Heterostylous; cleistogamous flowers 0. 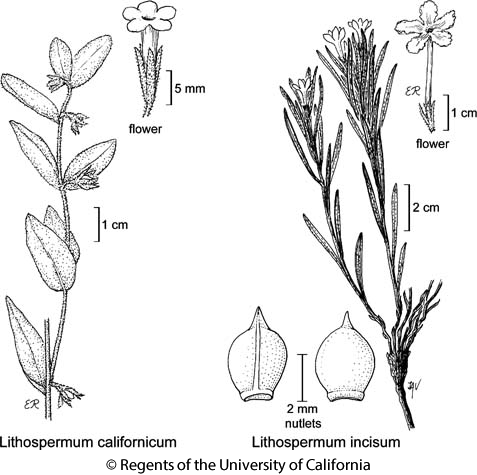 Citation for this treatment: Ronald B. Kelley 2012, Lithospermum californicum, in Jepson Flora Project (eds.) Jepson eFlora, http://ucjeps.berkeley.edu/eflora/eflora_display.php?tid=31253, accessed on April 20, 2019. KR, NCoRH, NCoRI, CaR, n SNH; Markers link to CCH specimen records. Yellow markers indicate records that may provide evidence for eFlora range revision or may have georeferencing or identification issues. Purple markers indicate specimens collected from a garden, greenhouse, or other non-wild location.